There has been a recent surge of interest in Ground Source Heat Pump (GSHP or “geothermal” or GeoExchange™) systems for residential projects. Outrageous claims and misunderstandings about how they work are common. 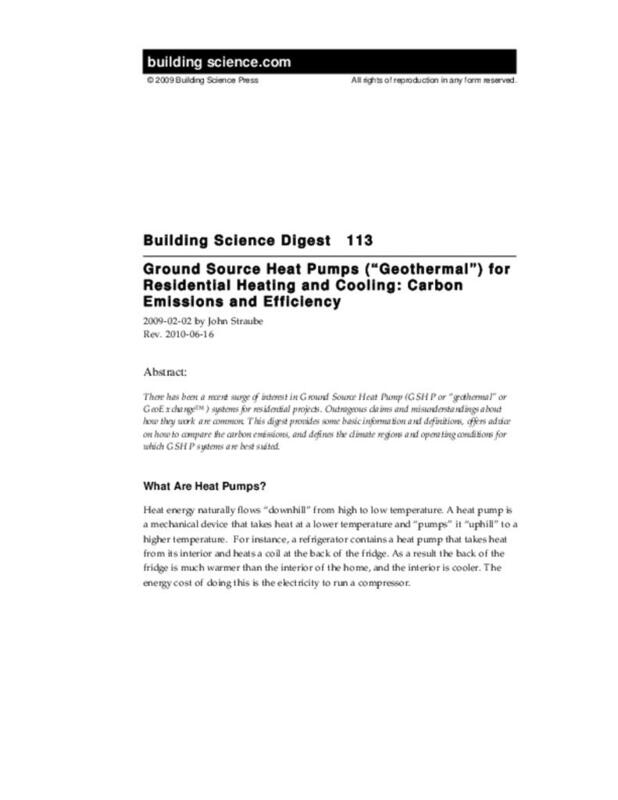 This digest provides some basic information and definitions, offers advice on how to compare the carbon emissions, and defines the climate regions and operating conditions for which GSHP systems are best suited. Heat energy naturally flows “downhill” from high to low temperature. A heat pump is a mechanical device that takes heat at a lower temperature and “pumps” it “uphill” to a higher temperature. For instance, a refrigerator contains a heat pump that takes heat from its interior and heats a coil at the back of the fridge. As a result the back of the fridge is much warmer than the interior of the home, and the interior is cooler. The energy cost of doing this is the electricity to run a compressor. Figure 1: The Fridge—A common heat pump. An air conditioner is a heat pump that takes heat from a coil in ductwork (which cools the air that passes over it, thereby cooling the home) and pumps it to an outdoor unit (which is hot, so that the heat is released to the outdoors). These are familiar and well understood technologies. Figure 2: A Standard Air Conditioner—An air-to-air heat pump that pumps heat from the interior to the exterior. A ground source heat pump either collects heat from the ground and pumps it to a coil inside the ductwork to provide air heating, or collects heat from the same coil in the ductwork (thereby cooling the air) and rejects it to the ground. An air-source heat pump, a more mature technology used for decades, collects heat from the exterior air during the heating season and rejects heat to the exterior exactly the same as a standard air conditioner does. In some systems the heat is not collected/rejected to a coil in ductwork, but instead uses a loop of tubing in a radiant floor or ceiling application. However, the fact the outdoor heat source/sink is the air means such systems are still air-sourced heat pumps. The terms geothermal, geoexchange™, or earth energy systems are sometimes used to describe a ground source heat pump system. However, geothermal heating is more accurately reserved for systems that tap into hot (ideally hundreds of degrees) rocks or water in the earth for heating or power production. Areas of the world with geysers and active volcanoes (notably Iceland and New Zealand) can often make good use of geothermal energy. GeoExchange™ is a newer and arguably more accurate term for the older and most accurate Ground-Source Heat Pump. The use of alternate terms provides little useful information and tends to be the product of marketing groups who have little interest in the underlying mechanics of GSHP. Figure 3: A ground source heat pump schematic (operating in heating mode). Heat pumps as part of manufactured systems like fridges are rated by the Department of Energy or NRCan for efficiency. A fridge of certain size (say 18 cu. ft.) is rated based on how much energy it should use in a year (for example, 500 kWh/yr would be a decent fridge). This makes it very easy for consumers to choose between different products. Unfortunately air conditioners and heat pumps do not rate efficiency in such a straightforward manner. A typical efficient air conditioner has a COP of about 3.5: this means it can remove heat at a rate of about 3.5 kW while consuming about 1 kW of electrical energy. The efficiency of all heat pumps increases as the “height” that must be pumped decreases. For example, to cool a home a typical conditioner must “pump” heat from a cold “A-coil” (the finned, radiator-like device hidden in the ductwork that picks up heat from the air flowing over it) temperature of about 50 F (10 C) to a hot outdoor “condenser” temperature of about 135 F (60 C) a “height” of 85 F (50 C). If the same air conditioner only cooled the coil to 60 F, the COP would be higher and the heat pump (air conditioner) would be more efficient. If the air outdoor was cool, say 70 F, the outdoor “condenser” unit sitting next to the house would be more easily able to reject the heat to the outdoor air and so the outdoor coil might only need to be at 100 F. In this scenario, the “height to pump” would be even less, at 50 F, and the COP (efficiency) would be even higher. Figure 5: The COP of a heat pump varies with the required temperature height that must be lifted. Air conditioning systems are rated based on how much energy they need to provide cooling under specific standard test conditions (a set height to pump). The rating is called the Energy Efficiency Rating (EER): it is the numerical ratio of the cooling provided (in Btu per hour) divided by the electricity required (in kW). This is a strange measure since it used Imperial units divided by metric units. It is easy to convert from EER to COP by dividing by 3.412. An air conditioner with an EER=12 would have a COP of about 12/3.412 or 3.5. Because not all hours demanding air-conditioning are equally hot, the Seasonal Energy Efficiency Rating (SEER) was developed to consider times when cooling is required but the outdoor temperatures are not as high. The conditions for the standard SEER test are a rather unrealistic 80 F indoors and 82 F outdoors: hence the temperature “lift” is small and so advertised SEER rating can often be artificially high (models with SEER=19 or a COP of 5.5!) are now available. In reality, the performance at outdoor temperatures of 95 or 110 F (when one really needs cooling) are a COP of 3 to 4, and claims of COP over 4 are hard to substantiate under realistic indoor conditions (76 F), and hot (over 95 F) exterior conditions. GSHP are unique in that their reported COP efficiency may not include the energy of the fluid or water pump required to move the fluid through the tubes in the ground. This electrical energy can be significant, particularly if the loop is long, the pipes are small, or the flow resistance within the heat pump unit is large. The largest factor in pump energy use is design: if the designer and installer of the loop and the pump are not careful, a major amount of energy can be consumed. Heat also needs to be removed by a fan or a pump and distributed to the home. To improve heat pump COP, the hot temperature of the liquid produced is often much lower than for a boiler or furnace (that is, the lift is less). Hence, fan energy can be increased over that of a furnace. This effect is very small in systems that use low temperature radiant heating systems (circulation pumps consume relatively little electrical energy). In heating mode in a cold climate, the system COP of a heat pump rated at COP=4+ can easily drop to COP=3. In our experience, a system COP of 3 for a heat pump in heating mode would be considered good in cold climates (cold soil) even with very efficient heat pump equipment and well-designed and installed pumps. Field heating mode COP values of as high as 4 are possible in warmer climates (warmer soil) and with the best design and best equipment. In cooling mode in mixed and cool climates, summer-time system COP values tend to be higher because the ground temperature in summer (perhaps 60 F) are close to the desired air conditioning coil temperature (40 F), whereas during winter, the heating coil temperature (at say 100 F) is far from the winter ground temp (say 35). That said, the electrical energy to run the pumps, fans and compressor of the whole system is useful heat in the winter (the inefficiency in the motors results in heating, which is the whole purpose) and increases the cooling load in summer (all of the inefficiency results in heat, which then has to be removed by the heat pump). A GSHP rejects and collects its heat from the ground. Hence, the temperature of the ground greatly influences its efficiency. Using a GSHP to cool a building when the soil temperature is 60 F will be very efficient (remember the heat pump would only need to overcome a “height” of 20 F to create a 40 F coil temperature). Alas, the houses that need the most cooling are in the deep south, and in the average temperature of the soil is quite warm in this region, closer to 70 F. As the summer wears on and the GSHP pumps more heat into the ground the temperature of the soil rises well above the temperature shown on the map below and the efficiency drops. If the heat dumped into the soil during the cooling season is not extracted by the heat pump for heating during winter, or not removed by a cold winter, there is a danger that the soil temperature will rise significantly over the years. This issue is even more significant in cold climates where the soil temperature on average is below 50 F. If a GSHP extracts heat during the winter it is quite common for the temperature of the soil around the ground loop pipes to drop to below 40 F and freezing is likely. Hence, the efficiency of the heat pump (which then needs to “lift” the 32 F ground temperature to 95 F or higher) drops. In climate zones with moderate soil temperatures (approximately 50-65 F), the soil can provide more energy for heating in winter and a better sink for cooling in summer. For mixed-climate zones, where heating and cooling are approximately balanced, the efficiency of a GSHP system will be higher, perhaps significantly higher, than a COP of 3. In these types of applications: moderate soil temperatures, nearly balanced annual heating and cooling loads, a GSHP can be an ideal solution. Figure 6: Map of average soil temperatures. The choice of a GSHP is often made to reduce emissions on the assumption that a COP of 3 would reduce emissions by a factor of 3. This is not true for most situations because the national electrical grid is both inefficient and carbon intensive (about 50% of all electrical power is generated using dirty coal plants). On average, the electricity system delivers about 33% of the energy in fossil fuels to the household as electricity. Hence, a unit of grid-generated electrical energy delivered to a house has three times the carbon intensity and fossil fuel consumption as the same unit of energy delivered via natural gas to the house. On average, carbon emissions average 1.36 lbs of CO2 per kWh of electricity delivered to a household (this information is available from the EPA eGRID project). This is based on energy generation, and does not include line and distribution losses, which tend to add around 10% to the carbon content of electricity. Assuming a system COP of 3, 1.36 lbs of CO2 would be created for the generation of 3 kWh of useful, or 0.45 lbs CO2 per kWh of heat delivered. Burning pipeline-delivered natural gas produces 0.40 lbs of CO2 per kWh of heat, if burnt at 100% efficiency. If a 92% efficient boiler operating on natural gas were to be employed to make heat, it would produce about 0.44 lbs of CO2 per kWh of heat delivered (plus any pump or fan electrical energy). Although the grid is well interconnected, there are broad regions of the country which have higher and lower CO2 emissions than average depending on their generation mix. For example, in the Pacific Northwest or Quebec, electricity is generated from clean hydro, and the emissions are only 0.36 lbs per kWh electricity in Washington State. Hence, a COP=3 GSHP in Washington would reduce emissions by a factor of over 3 versus a natural gas boiler. Given the mild temperatures, and usefully warm ground temperatures, a GSHP would often be a good choice for reducing CO2 emissions in this situation. In North Dakota, however, the CO2 emissions are 2.39 lb CO2 per kWh electricity. Given the cold winter temperatures (ie, large heating load) and low ground temperature (and hence a much lower COP than Washington state), a GSHP could increase emissions by 50% above a high efficiency natural gas furnace, and result in a significant increase in total carbon emissions per household. As our sources of electrical energy become cleaner (i.e., less carbon intensive) or if electricity is renewably generated wholly on site, a GSHP system will reduce the operating costs and carbon emissions relative to most other available heating/cooling technologies. However, to be cost competitive, the building should be very well insulated and airtight with very good windows, shading, etc. Energy efficiency upgrades are almost always the environmentally and economically superior approach. One potential, and likely, vision of the future has super-energy efficient houses coupled to photovoltaic systems that generate about 50 to 75% of the total annual energy use of the home. Grid connection allows the house to have momentary surges of power consumption and power production. The 25% to 50% annual energy deficit can easily be made up of no- or very-low carbon electricity delivered by the grid. In this future it would be desirable to eliminate the carbon emissions of the already very low emissions generated by burning natural gas. Heat pump systems, whether air-sourced or ground-sourced are the obvious choice to provide cooling, heating, and dehumidification in such a future. Hence, continued work on improving the efficiency, reliability and cost effectiveness of heat pumps must continue if and when such a day comes. One innovative approach that holds promise in colder regions is the use of solar heating or waste heat to charge the ground loops during sunny weather so that during the subsequent heating season the COP is significantly higher. The challenge with this approach is the very significant losses of solar energy injected into ground loops. Recent advances in refrigerants, modulating compressors, and electronic expansion valves have made air source heat pumps much more efficient and powerful at very low outdoor temperatures (down to -25 C / -13 F). Such low temperature air source heat pumps are generally much less expensive to install and require less work on site. Low temperature air source heat pumps will be the subject of a future Digest. Ground Source Heat Pumps are just one of many heat pump systems available. Although claims of very high efficiency are made, field experience suggests that real systems have somewhat less performance. For climates with moderate ground temperatures, and buildings with approximately equal annual heating and cooling loads, GSHP system can be an ideal solution. The claim that GSHPs substantially reduce carbon emissions in all cases is difficult to substantiate. Because of the inefficiency and carbon intensity of the national electrical grid, the carbon emissions of a GSHP system with a COP of 3 is approximately the same as a natural gas condensing furnace or boiler. In cases where natural gas is not available, or the electrical supply is cleaner than average, even a COP of 3 will result in carbon emission reductions. In many states, and as the grid becomes less carbon intensive, a best-in-class GSHP (COP of 4 or 5) using emerging technology will begin to save significant quantities of CO2 emissions. Of course, until the building is highly insulated, airtight, properly ventilated with good windows, GSHP should not be specified if cost-effective and resource-effective carbon and energy reductions are sought.